One night each year at a local Walmart, The "Shop with the Sheriff" Event pairs children who are referred by local non-profit agencies, with volunteers from the Sheriff's Office and the community for a once in a lifetime shopping trip where they can purchase items for themselves and/or members of their family. The Honory Deputy Sheriff's Association provides funding for 200 children to participate.The 2017 Annual "Shop with the Sheriff" Event was a huge success. 238 children were able to participate in this year's event, with each child being given a spending limit of $200. When that limit was surpassed Deputies, Honorary's, and volunteers stepped up and paid the difference. We couldn't have done it without the continued support from the Washoe County Honorary Deputy Sheriff’s Association. 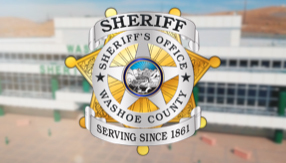 This year the "Christmas on the Cooridor" program partnered with the Washoe County Honorary Deputy Sheriff's Association on their 15th Annual "Shop with the Sheriff" Event. We look forward to next years event!